Katie joined Proud Fertility with over 10 years¬¬¬¬ of experience in business development, strategic and logistical planning, and lends her skills in managing and developing digital and traditional marketing campaigns for niche markets to her role as Marketing and Communications Specialist. Katie contributes a unique style of progressive thinking, client advocacy, and brand awareness that are essential to Proud Fertility’s formula for success. Katie is known for the pride she takes in building strong relationships with clients, colleagues and allied businesses; attributes that will help expand the company’s abilities to provide clients with maximum opportunities. 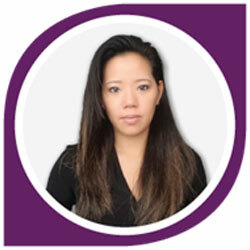 Although Katie was born and raised in Alberta, she has roots in Hong Kong and speaks fluent Cantonese. She enjoys travelling and currently splits her time between her homes in Edmonton and San Francisco. Like many of the Proud Fertility family, Katie and her partner have embarked on their own personal journey to become parents through a Sperm Donor and will be able to offer that understanding to Proud clients.